"You don't need an argument for buying butter. It's a natural, human instinct." OK, so, we've had what is apparently a very unusual summer here. Lots and lots of rain--like, rainest July on record, wettest this of that, blah blah blah. I don't really mind this, because it's kept temperatures down remarkably well. But yesterday, the crazy weather went REALLY crazy. First, in the early afternoon storm clouds loomed and everything got dark. This made apparent a cool feature on my brand new MacBook Pro (really brand new--I got it yesterday morning and was doing file transfers as this was happening)--it reacts to ambient light by altering the screen brightness and turning on lights under the keyboard. Very pretty. It also brought hail. Like, not very big, but nonetheless noisily crashing hail. It cleared up for a while after the hail, but then, just before sunset, it started raining crazily. Blowing in this front window a bit, obviously. And at one point I got up to go look out my bedroom window, and realized that a sheet of water was coming off the roof above it... and since there's barely an eave there, it was getting the window sill remarkably wet. Even as the rain was still coming down strong, I noticed this, though... the setting sun starting to blaze out". Quite an impressive rainbow, actually. It's a shame that they never look as cool in pictures as they do in real life. I should also note that it was still raining as I stood on my deck and took these. So I got rather wet. The things I do for you, my faithful few blog readers! On a completely other note, I just finished reading a rather good book that I find myself wanting to discuss, Tana French's In the Woods. It's a Dublin area set mystery that concerns two crimes, one new and one twenty years old. One is solved, one remains a mystery. I've thought enough about this that I actually looked up reviews on line, and some readers seem annoyed that both aren't solved. That didn't bother me, really, particularly since I know that she's got a new book that's... well, it's not a sequel, but it involves some, at least, of the same characters. I'm more troubled by the fact that I knew who the villain was from the very beginning. It's not the fact of knowing right away that bothered me, because what it meant was a greater degree of tension while reading, but rather that I can't figure out if the reader is supposed to have known. I initially assumed that I was, because of the way it ratcheted up the tension. But then after the big reveal, the narrator, who's a very literarily conscious narrator, very aware that he's telling a story to readers, addresses his audience, saying, hey, if you think I should have known about this sooner, well, you were taken in, too. But I wasn't. So now I can't tell if the author really thought that we would have been taken in, or if this is just more posturing on the part of the narrator. Man, that probably doesn't make any sense if you haven't read the book. Well, it's a good mystery, I thought, if a little over-long. So quibbles aside, I'd recommend it. Because I am not really someone who can knit and read at the same time (I think that in principle I actually could, but it would require either a better book stand/holder thing or an uncomfortable posture, neither of which appeals), I've been generally knitting a bit less than normal this summer. Instead, I've been reading lots and lots of novels (mostly), which has been enormously enjoyable. This was my normal way before I started knitting, and it's really, really dangerous. I am generally far more capable being sucked into a book to the point of being unable to stop reading for such petty things as going outside than I am capable of knitting for such long periods. Thus, I've torn through a lot of books already this summer. I had a bit of a slowdown for David Simon's Homicide, a book I've been meaning to read for years, and which was interesting both for itself and for seeing the seeds of both the TV version of Homicide and The Wire, but which was also at times a bit of a slow read. And I also had a brief slowdown in the midst of Julian Barnes' Arthur & George when it suddenly turned into a miscarriage of justice story (which I should have expected, given that it's based on a real-life incident, but which I didn't because it's not an incident I knew of), which is a kind of story I find particularly upsetting. No, seriously, false accusations and authority figures run amok make me cringe--I had a huge problem with Harry Potter and the Order of the Phoenix partly because of this, though I also read on through the icky feeling--just like embarrassment humor makes other I know run away. Now, anyway, I said generally. But then there are times when I get near the completion phase of some knitting project and I knit like mad. This weekend was one of those times. So, before the weekend I'd gotten to this point using the linen yarn I dyed. I knew that I hadn't done a very good job of dying the various skeins equally--that is, I could see that the colors had pooled differently on different skeins. That meant that if I knit from one skein, and then switched to another, there'd likely be a real difference in how they looked knitted up. So, I've knit this whole thing switching skeins every two rows. That evens out the variation in the dying. It's a little hard to see, but what I've got here is a garter stitch bottom border, and then a lot of plain stockinette, without even any shaping. I decided I wanted this to be a somewhat blocky cardigan, because that seems to fit with the somewhat stiff fabric the linen's making. Now, it's at this point that I had to make some decisions about what to do next--I got to the point where adding in sleeves made sense. And that means I got to an interesting point, and a point that's fairly close to some end point. Which meant that knitting took over. At some point yesterday I'd gotten to this point. Which is the body completely finished and bound off part. I decided that I wasn't yet sure what kind of sleeves I want on this sweater, but I did know that I wanted to do a nice simple raglan sleeve cap. And so, aha! I realized, I could provisionally cast on the stitches for the sleeves, finish the rest of the body, and then go back and knit the sleeves down in whichever way I want. So, that's what I did. I also did a very gentle v-neck shaping on the fronts, here--which are also, for what it's worth, slightly less than half the width of the back. This is purposeful. Because since I took this picture, I've also picked up stitches all the way around the cardigan's front and neck, and nearly completed knitting on a very wide, garter stitch button band/collar. I've got a couple more rows of that to do, and then I think I'm going to do a sewn bind-off, because I like the looks of those quite a bit, even though they take forever to do. I'm reasonably happy with how this is coming out, all things considered. It's a little sherbet-pastel for my normal tastes, but for summer I suppose that's OK (I'm also thinking of dumping the whole thing in a tea bath to mute the colors a little). I'm also going to have quite a bit extra yarn. I'm still working on the first two skeins of four, and I may even manage the sleeves out of those two skeins, depending on how long I make them (at the moment, I'm thinking wide, 3-4 length sleeves). And I'm using size 2 needles! Incidentally, through all this knitting I've been making good (though not necessarily entirely proper) use of youtube. I'm not sure exactly why, but suddenly this weekend I got sucked into watching vast amounts of the new Doctor Who, virtually all of which is available on that site. I'd already seen the first half of the first season, and the last half or so of the third season, and so I did some catching up on what came between those points. I have to say, that's a pretty fun show. I'm in a complaining mood. Blame a bit of school stress (which, yes, should be done by now, but isn't). Squirrels! Or, whatever keeps digging in my pots! The battle wages on, ever and eternally, it seems. Let's put it this way--I identified a bit too much with this NY Times article today. People who write in library books. Yesterday I wasted half an eraser ridding a university library book of pencil (thankfully) marks so I could photocopy it for a course packet. And still there's a bit of ink in there that annoys. And don't even get me started on the people who feel compelled to correct or otherwise write in public library books. I recently read a humorous novel in which someone had underlined every reference to mental illness, and corrected syntax and grammar (SOMETIMES WITH A QUESTION MARK, like, they weren't even sure of their corrections!) to boot. ARGH. People who don't pass people turning left. Driving in this city is generally not fun, which is why I don't do very much of it. But what really annoys me are not left turners--I mean, sometimes you've got to turn left, so what can you do?--but the people who pile up behind the left turners instead of passing them, thus really blocking traffic. Granted, sometimes you can't pass, but often... YOU CAN. My current ISP. My connection speeds have been incredibly erratic recently, and when I've called to try to get things fixed, the tech people have been just as much salespeople trying to get me to upgrade as tech people. I keep telling them that I'm unwilling to spend MORE money with them to upgrade if I don't get a stable connection for a while first. Whatever. In the meantime, I have apparently become hooked on So You Think You Can Dance. Seriously, some of these people are freaking amazing! Like this guy, who didn't get past the audition round, but who... it's like he has no bones... or like some invisible giant is moving him around. CRAZY. For some reason, I've been going through a robot phase in my popular culture consumption. Even more, a "humanoid robots don't know they're robots" phase. Which means reading Do Androids Dream of Electric Sheep? and watching a bunch of the new Battlestar Galactica. Both are things I probably ought to have done before now, given my general pop culture proclivities (I'm not a huge sci fi person, but I'm enough of a dabbler in sci fi that I'm at least familiar with a lot of big name things). This picture, by the way? An example Ziti's moments of turning into an attack cat. 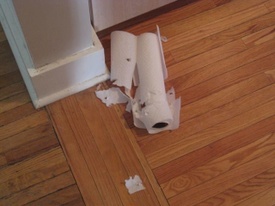 Every so often, he decides that the paper towels are his enemy. It's as if suddenly his true Cylon nature is emerging from his normal sweet cat persona! Anyway, I'm not entirely sure how I feel about either of them. I'm not sure what I expected from the novella--I know I've seen Blade Runner, but I don't remember when, or which version. So I had vague expectations for the novella, plot-wise, few of which were realized. And the TV show? Again, I think there's a bit of a problem in that I have at least a vague sense of where the whole story goes, from general pop culture, which takes away some of the suspense. As a result, I find bits of it kind of draggy. And the whole thing needs a significantly higher dose of humor, as far as I'm concerned. I think it's possible that the Dr. Baltar/Six stuff is supposed to be funny. But I find it deeply, deeply annoying, unpleasant, and unfunny, but for a couple of exceptional moments. So, there you go. The BG watching has been part of my general catching up on pop culture things I've been behind on over the last couple of year. I've gone to see very few movies in theatres since moving here (the film festival was an exception). While I was in Chicago at the holidays, my parents and I watched Ratatouille, which I thought was pretty darned brilliant. 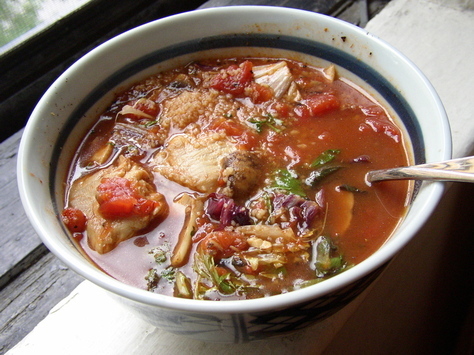 And just today, I came across a link to this: "The Rat's Ratatouille," which I'm now hankering to make. I think, though, that it probably deserves to be reserved for the harvest. 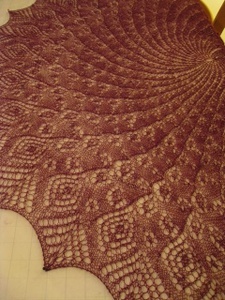 And now the lace shawl. 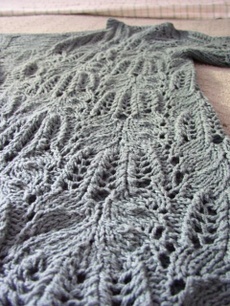 I finished the Queen Anne's Lace shawl! For some reason this past weekend I was struck with an intense desire to finish, so finish I did. It was a lovely knit. Different every round, so it kept my interest. The pattern was virtually error free--I think two rows in the chart were off by a stitch, but it was easy to see and correct the mistake. The only issue for me was the yarn I used. It broke. Several times. 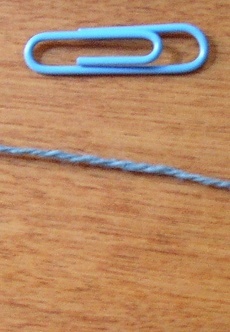 And at one point the skein itself seemed to be broken internally. And at various points I could see that one of the two plies was broken. My solution, perhaps not the best one, was a whole bunch of spit splicing, with a loooooong overhang, so that even if the felting gives way, the two ends are well knitted in. Hopefully it'll survive. This isn't, by the way, its final blocking. I need a larger blocking surface, so I'm either going to start the process early in the day and use my mattress, or I'm going to hit Home Depot and buy a couple more panels of foam insulation. But, I wanted to get a sense of how big it'll be, and how it'll look blocked, so I pinned out this half. My copy of Harry Potter came yesterday, and I pretty much immediately sat down and devoured it. This is the enormous advantage of the academic life, particularly over the summer, and particularly when you're in the sort of place that I am right now, just back from a long trip and thus transitioning a bit from one project to another. There's time to decide that a Thursday afternoon can be devoted to reading a novel, since Saturday and afternoon can quite easily be spent writing. I didn't really try to predict anything about the book before hand. I was pretty sure of a few characters who weren't going to die, and was right about all of them. I was pretty sure of Snape's story, and was right about that, though there was more to it, in a way, than I'd expected. The many deaths? A lot of them were surprising because they involved characters I just hadn't even considered as possible death candidates. The one I'd been spoiled about was also the first one, which meant that I ended up feeling simultaneously sad about it and relieved that I could go back into my preferred state of not knowing anything right away. Anyway. I cried here and there through the whole thing, and then burst into a final shower of tears as I finished it off, not because of anything on the page, but because it's all over. It's not that I really think they're "great literature," but I do think they're great stories. And I've really got to give her credit for bringing such an enormous story to an end pretty convincingly and satisfyingly. Last night I had my first run in with a Harry Potter spoiler that I couldn't avoid because I didn't see it was coming. It was on a knitting site, in a thread that gave no indication that it was about any such thing. ARGH. I realize this suggests that I'm a) five or b) taking this way too seriously, but I've been a little sulky about it ever since. I should just buy the Canadian version, I know. But, I also have two... well semi-raves. Or, one "this was pretty good" and one rave. This was pretty good as a quick summer meal that was thrown together with whatever I had around. In a big saucepan I heated a bit of olive oil, threw in one chopped clove of garlic, salt, pepper, and some dried oregano and basil. Then I tossed in about half a package of sliced cremini (I think... the ones that get sold as "baby bellas" or whatever) mushrooms and let them frizzle for just a tiny bit. Then, a can of chopped tomatoes, juice and all. I thinned the liquid with some vegetable broth and water (night one it stayed fairly thick; night two, above, I thinned it more to a broth). Cover, let cook until mushrooms are close to done. Then I just put on top of it all tilapia fillets (in this case one of those doubled pieces that I assume come from one fish), covered again, and let steam/cook for about five minutes. At that point I broke up the (pretty thoroughly) cooked fish into the mixture. On night one, I ate it over (and I know this sounds weird) mesclun greens, which got kind of wilty. On night two, I thinned it more, picked out the frisee and radicchio from the greens mix, tossed them in at the end and let them soften a bit, and also cooked up some couscous to put under it all. Oh, I also put in a couple sprinkles of cayenne to give it a bit of heat. Both ways, delicious, if I do say so myself. The rave is the Mr. Clean Magic Eraser, which my mom told me about. Oh my gosh, my bathtub has not been so clean in... ever. It really is sort of magic. Doesn't seem to work on rust stains, but everything else? Amazing. And thus, the fact that it's been more than 36 hours since the new Harry Potter was released and I do not yet have a copy in my eager hands is a demonstration of some bizarre... I don't know, weather event, or something. You see, here's the problem. The Canadian versions of the Harry Potter books are the British versions. While in the abstract I'm all for that, all my other books are the US editions, which are a different size, and completely differently illustrated. Due to a certain completist mentality (whenever I pass that bookshelf, I'm a bit annoyed that my copies of Dorothy L. Sayers' books are from at least four different editions), I MUST have the US edition. And that means ordering from Amazon, and waiting for international shipping. Augh! I have seriously been checking my account on amazon.com far more frequently than is strictly speaking sane, watching for it to have been shipped. It now has. So now... more waiting. Now, the title of this is slightly challenged by the big knitting project of the second half of my trip, the frost flowers cardigan. I know I put up one picture, but here are a few more, with discussion of how I made it. 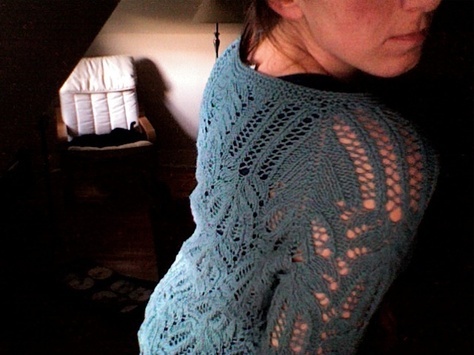 For most of its knitting, this was a pretty easy project. As others have commented, frost flowers is a pretty easy to remember pattern; for all that it looks really complicated, it's really just a four row repeat that's shifted every three repeats. But that simple repeat pattern really does create a cool fabric. For all that it's simple and easy to memorize, though, I used really fine yarn. No, really. I did make one concession to its thinness. I doubled it. But, still, that's basically doubled crochet cotton (except this was "Lenok," 80% cotton, 20 % linen, that same yarn I used for the little bag). 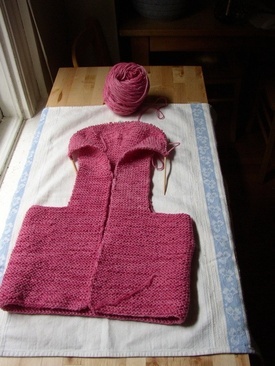 Then, I started the sleeves, which I knit flat at the same time. If I'd had another long circular, I'd have done them in the round at the same time, but, well, I didn't. I started with 36 stitches for each--that's one repeat, plus a single knit stitch at the beginning and end of every row. In retrospect, I'd have done a couple of stitches at the edges, and kept them stockinette, not garter stitch. But, there you go. I knit half a pattern repeat (12 rows) without increases, and then started increasing into those first and last knit stitches. I think I increased every six rows, but I can't quite figure that out from looking at it. I knit them for four pattern repeats, by which time they were a tiny bit shorter than I thought they ought to be, which was actually sort of a plan, since every time I've done a raglan sleeved sweater, I've ended up with too-long sleeves. So, hah. (An aside. See Ziti on the chair?! He was sleeping when I started taking these, then woke up and popped up his head, and then started flipping around. He's doing better). In order not to drive myself insane, I realized I wanted to do the raglan decreases with the pattern the same on both sides of every "seam." So, when I joined the main body and the sleeves, I actually had to fudge the joins a little bit. It's normal to put a few stitches for the, well, armpit, on waste yarn (or to bind them off) when you're bringing these parts together, which I did. I just didn't take off the same number from body and sleeves. I think I did six from the body, and four from the sleeves, figuring I'd want to pick up a few stitches near the joins to close any holes, and that this would work well for that. Which it TOTALLY did. Basically, all through the pattern there are columns of reverse stockinette between the two elements of the pattern. 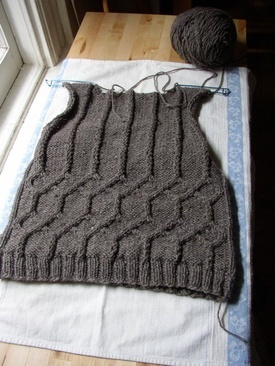 I used those columns for the basis of the raglan shaping, with mirrored patterns on each side. I did the raglan decreases following the pattern changes for I think one (or one and a half) patten repeats, and then just kept going in the section I was on when the number of stitches got to the point that I couldn't do a full repeat of one of the patterns (the flowery bit takes more stitches than those vertical open passages, and so there got to a point where It would have been edges of vertical with a center of stockinette, which seemed silly). I kept the garter stitch edges, and when I got to the point that I though the sleeves were done, I just did a few rows of garter stitch all the way around (still with decreases) to finish it. And then I bound off, did the sleeve seams, and sewed in a lot of ends... and that's that. The hardest part was figuring out how to join the sleeves to the body. Once I realized I could be take off different numbers of stitches in order to keep the pattern consistent, though, that became really, really easy. Keeping track of the pattern with decreases and increases (in the sleeves) was a little tough, but by that point I'd knit it so much that it was much less difficult than I'd expected. During the looooong process of revising, I did, of course, knit. In fact, I kept starting things. Thus, three more things on needles. First, the cabled... something... from the colored Australian wool. I'm quite pleased! I cast on in the round and did two repetitions of the cabled pattern, and then continued with straight mock cables, basically, up the main body. I decided that the all-over pattern might be too much. Of course, now the interest is around the waist, which is also not perhaps brilliant, but we'll see. At various point I've been asked if it's a child-sized sweater, because especially when it was still all in the round, it seemed rather small. But, honestly, it's not. I did want it close-fitting, and it is, a bit, but not overwhelmingly so. 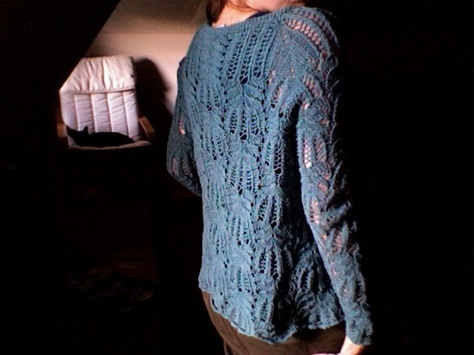 I've finished the back, and have stalled on the front. This is largely because it know requires thought, which I wasn't much able to give it. I'm going to to a v-neck, and I just had to think about where I wanted it to start. I'll probably get back to it within the next couple of days. I'm also not sure if it's going to stay a vest or if it's going to turn into a sleeved sweater. I didn't think I'd have enough yarn, but now I do think I will. But I'm not sure if I'll like it as a full sweater. Decisions. When I decided that the cabled vest (I'm going to stick with that for the moment) was requiring too much thought, I cast on another project. Last year sometime I ordered this yarn; it's Araucania Nature Wool, and it's way too pink for me. I don't really know what I was thinking. But despite the too pinkiness, it's really lovely wool. I decided that, really, it's too pink for most adults, and so I'd play around with kids things and either give them to kids I know, or donate them to the Dulaan project or something. I think I'll try another of her baby sweaters next, because she's got some interesting construction, most definitely. And I've got a fair bit of this pink. Which, again, pretty, but not for me or for any adult I know. Finally, there's another beginning of a lace project. 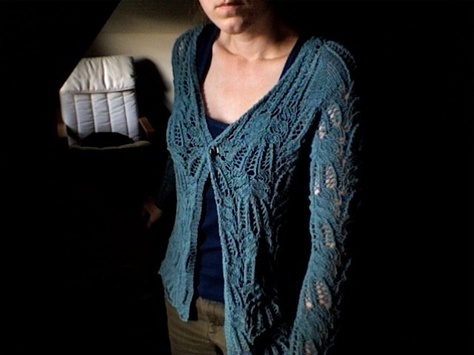 Again, the lace-weight alpaca from Laura. 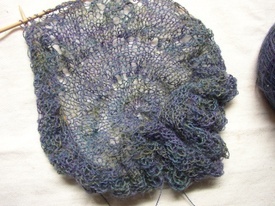 This time, I started the Shetland Tea Shawl from A Gathering of Lace. But I'm not sure I like it, really. Sigh. I should give it a bit more time to grow on me, I suppose, but at this point, I'm thinking I should try yet something different. Perhaps the Shetland sampler from the same book. That might be better. Anyway, I'll figure out something to do with this yarn sometime. Eventually. Or maybe I should just try doubling it and doing the Frost Flowers and Lace that I originally wanted to do. Argh, again. Decisions, again. This is why I've been stalled. I've also got another sock started (toe-up, adding an eyelet ribbing), and I've finished the blue scarf (it's now waiting to be washed, which I think will happen on this somewhat gloomy Sunday), and also the red boucle sweater, which I think I'll wear tomorrow or Tuesday, and then will take a picture of on with my office computer. Anyway. In other news, last night I could not put down Mark Haddon's new book, A Spot of Bother. I didn't love it in the way I loved his first novel, as it was, frankly, kind of disturbing/upsetting/I'm not sure how to describe it. But he's extraordinarily good at capturing a sort of everyday dread. You know, now that I think about it, I had exactly the same reaction to the Barbara Pym book I read last month (or sometime). I found it compulsively readable, a real page-turner, despite being about, in essence, nothing more than assorted vaguely damaged English people bumping into each other. Meanwhile, I started Richard Price's Clockers more than a month ago, got only so far, and have since had to renew it twice in hopes that I'd eventually actually read it. Well, maybe now.